Then the usually astute Chris Collinsworth said something, just one line, that gave me reason to hope. He mentioned how the 49ers defense had played 90+ snaps the previous week against New England, and that on the team bus to the airport, Harbaugh reported his team was absolutely dead. Normal chatter and celebration following a big win were replaced with silence, a sign that his team had no legs in it. I can certainly attest to how tired the 49ers looked both at the end of that game and the entirety of this one. And I've certainly seen the effects fatigue can have on a team in general, such as what happens in a Thursday night game (including the first messy Seahawks @ 49ers matchup. But does fatigue in terms of snaps played on defense have a meaningful effect on the defense? I went to the stats to find out. I've isolated defensive metrics for a few reasons. 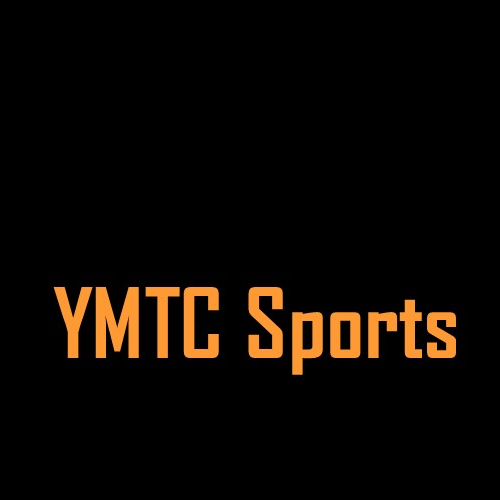 First, I didn't see anything alarming from the offense last Sunday: they had some big plays but had trouble punching into the end zone against a talented defense. This makes sense if you consider Seattle was missing a few defensive backs (explaning the big plays) but was still a top scoring defense overall (getting tough with fewer yards to cover in the red zone). Also, there is a general perception (which could be wrong) that offense requires stamina, seemingly brought on by the fact that A) some offensive players can take snaps off but defensive players never rest because they never know what the offense is doing and B) the offense forces the action, and reacting is harder. What I did was simple: chart the plays/game from weeks 1 to 15 and see if it had an effect on defensive stats in week 2-16. While the sample size is relatively small in terms of games analyzed (only 15), some of the stats use per/play data which I think gives some semblance of sampling population given the hundreds of plays the 49ers defense has been involved with this season. I think what I found was a bit surprising. 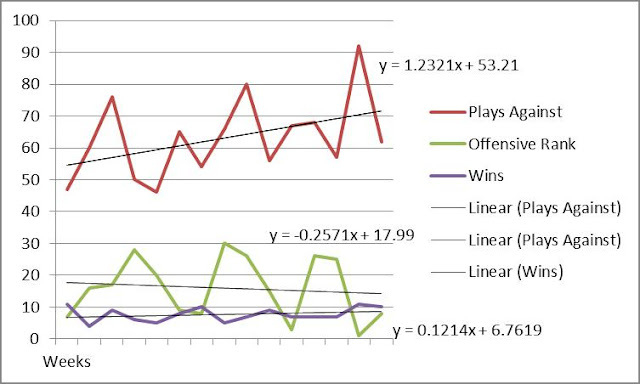 First, I charted plays/previous game against points allowed during the current week. Stats start in week 2 due to the fact that the 49ers did not have a meaningful opponent that would tire them in the weeks prior to week 1 against the Packers. 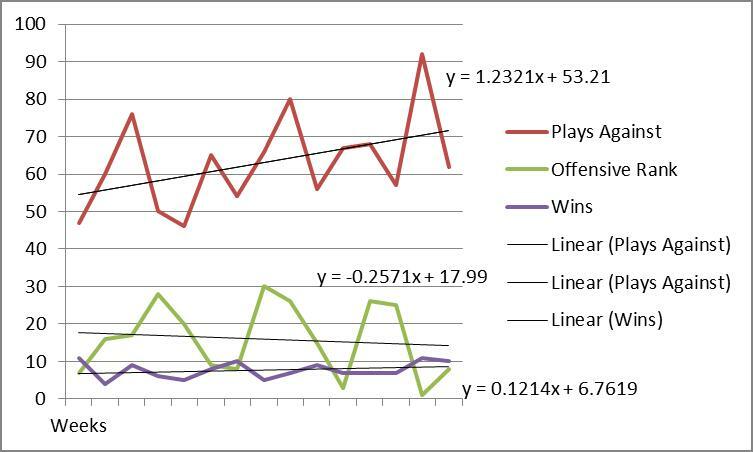 This shows again that Plays Against have increased through the season, but that strength of schedule as measured by Opponent Wins (purple line) has stayed relatively flat, and while strength of schedule measured by Opponent Offensive Ranking (green line, data found here) has decreased (lower is better, as the highest ranking is 1), the slope of the line is nowhere near as dramatic as the upwards slope of the Plays Against line. That Plays Against is rising so much through the season is surprising because of the rate of increase, but I'd have to compare it with the data from the other 32 teams to determine how much of a statistical oddity it is. Perhaps offenses are simply running more plays because they have more film on the 49ers defense and are able to scheme against it more effectively. Going back to the first chart, that certainly bears itself out in the Points Against line, where the 49ers have allowed more points through the season (even if you take out the last two weeks). But comparing the Plays Against and Points Against lines is the most interesting part of the graph: until the last week or two of the season, these lines have a negative correlation. Every time the Plays Against line spikes, meaning the previous opponent ran a lot of plays on the defense, the defense recovers by allowing much fewer points in the next game, evidenced by valleys in the Points Against line. The negative correlation is uncanny. Previous Week Plays spikes in each of the weeks 4, 6, 10, 13 (meaning the defense faced lots of plays in weeks 3, 6, 9, and 12), but in each of these weeks, the defense gives up much fewer points (at least until the Patriots ran a lot of plays and the Seahawks blew the 49ers out). Maybe after each lackluster defensive performance, the effect of Harbaugh's wrath was enough to evoke a stronger performance a week later. We see them some of the same negative correlation early in this chart, especially in weeks 4 and 5. 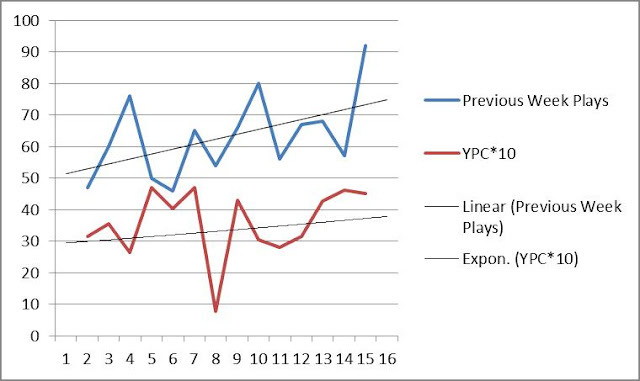 But when the 49ers faced a lot of plays in weeks 6 (shown as a spike in week 7), their week 7 YPC stat also increases. 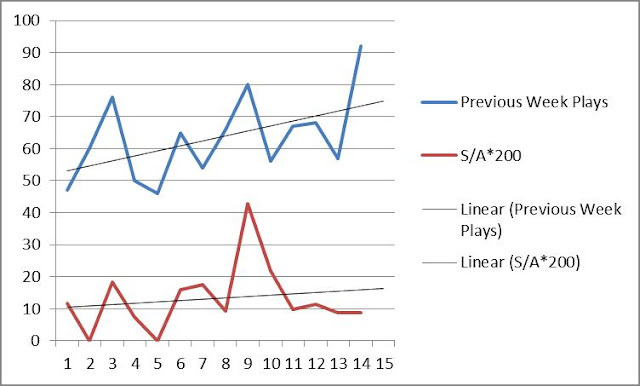 The lines more or less correlate from then on, showing that the tired defense generally gives up more rushing yardage as the season progresses. Also, the normally tough run defense of the 49ers goes from a stellar ~3.0 yards/carry in week 2 to over 4.5 by week 15, which is very alarming. How about another stat? While the YPC stat correlates with Previous Week Plays Against (I'm going to start using PWPA), the opposite is true here. 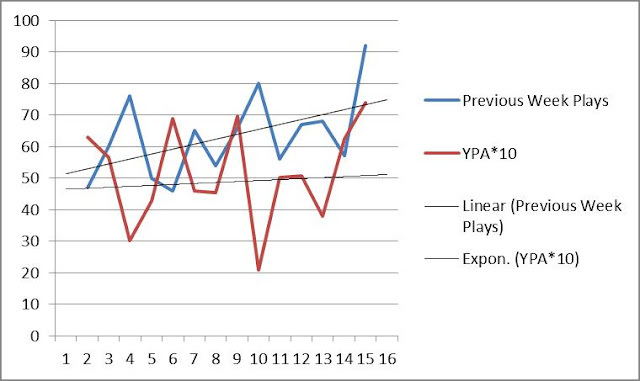 It seems that passing yards/attempt follow the Points Against model with a negative correlation to PWPA. 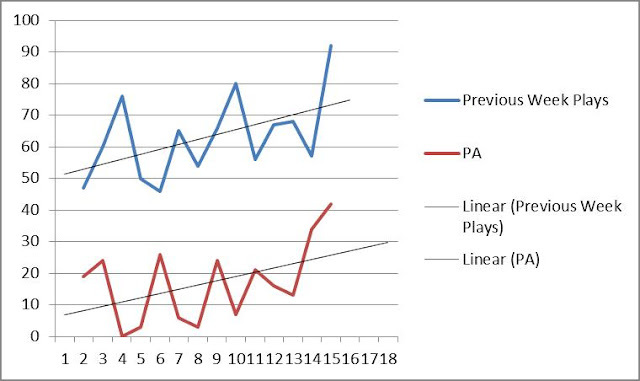 PWPA spikes in week 4, correlating to a fall in YPA; the two reverse in week 6, reverse again in week 7, and continue to do so in weeks 10, 11, and 13, before matching up for the last two games. The other interesting thing is the trend line. 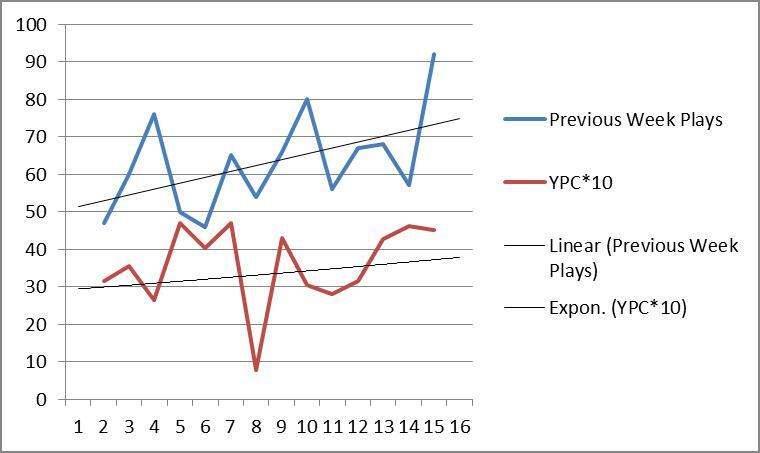 The Yards/Carry trend line increase almost a full yard through the season, which is ~33% worse than the week 1 average. 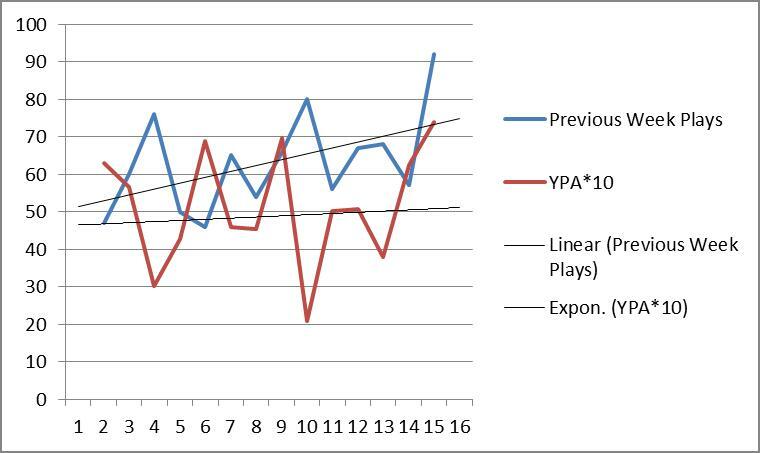 And while the Yards/Attempt trend line increases by only ~0.5 yards, around a 10% increase, despite the prolific passing of Tom Brady and Russel Wilson over the last couple of weeks. What about sacks? Too me, sacks can be an effort metric like rush metrics, as passing yardage can get a little out of hand sometimes (especially in today's NFL). Sacks are obviously a very lumpy statistic, and the small sample size limits somewhat the efficacy of this metric. But this metric seems to correlate reasonably with PWPA, like the rushing yards stat. I attempt to make sacks more meaningful with this metric. The 49ers sack totals spiked in week 8 because the Cardinals called an insane amount of passes in that game (I know, what where they thinking), which led to more sacks. 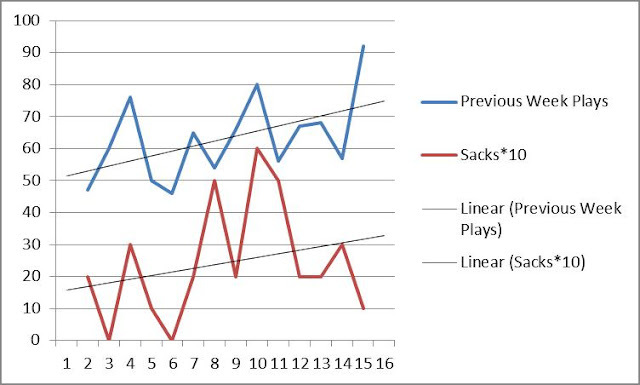 This chart shows sacks/passing attempt, and the Week 8 game actually shows for how much Arizona passed, the 49ers didn't actually get to the QB that often. Still, the stat correlates fairly well with PWPA. To sum up, it looks like the rushing/stat related metrics follow PWPA throughout the season: the more plays a defense faces in the previous week, the more setting the edge and meeting the offense at the point of attack suffers. However, passing yardage seems to have nothing to do with how tired the defense is, perhaps showing the more volatile nature of passing in general. Fatigue may very well have led to the 49ers defensive collapse against Seattle last Sunday, as 92 plays against the Patriots is really the outlier in the entire data set. The most concerning takeway for me is that the 49ers have been facing more and more plays each week as the season has progressed. As they have done so, their effectiveness against the run has eroded. In order to win against run-heavy teams like the Vikings, Seahawks, and potentially the Redskins in the playoffs, the 49ers must be able to dominate blockers in the run game.